Hey friends! I had one of those moments in the grocery store where you impulse buy a bunch of things because they're on sale...and then realize that you're not quite sure what to do with them. Hello cranberries forever and ever. I'm kind of completely in love with their tart, unique flavour, but they're not always the easiest thing in the world to use. (I've put them in a pie with apples here, and in a savoury butternut squash situation here). I picked up a gorgeous (gold!) 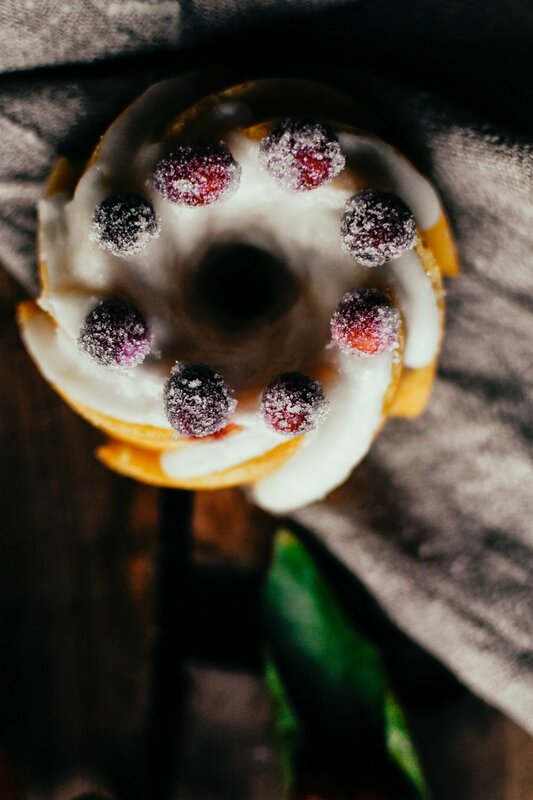 mini bundt pan a few weeks ago, and thought it would be fun to bake them into a cake. Of course, orange was an obvious choice to pair with the cranberries, and I decided to try out Laura from Tutti Dolci's recipe! I made some simple sugared cranberries to decorate the tops, and think they turned out so stinkin' cute. Preheat oven to 350 degrees F. Spray bundt pan with nonstick cooking spray. In a medium bowl, whisk together the flour, baking powder, baking soda, and salt, and set aside. Reserve 1 tablespoon of this mixture to toss cranberries in (*this will keep them from sinking in the batter. In a large bowl, beat butter with sugar and orange zest at a medium speed until pale and fluffy. Reduce the speed to low, and add in the eggs one at a time, mixing completely after each addition. In a large measuring cup, combine buttermilk, orange juice, and vanilla. Add flour mixture to butter mixture in 3 additions, alternating with buttermilk mixture - start and end with the flour mixture. Mix until just incorporated. Toss cranberries with reserved 1 tablespoon of flour mixture, and gently fold them into the batter. Carefully spoon the batter into your bundt pan, and smooth the top of the batter to ensure a flat bottom of each cake. Whether you're making one large cake, or minis, you'll want the batter to fill about 3/4 of the pan. Tap pan firmly on a tabletop to get rid of bubbles in the batter. Bake for 20-25 minutes, or until the cake is golden, and a tester (I used a toothpick) inserted in the center comes out clean or with a few crumbs. Cool in the pan for 15 minutes, and then carefully invert and tap cakes out onto a cooling rack. In a small saucepan, stir together sugar and water and bring to a boil. Allow mixture to boil for a minute or two. Remove from heat and stir cranberries in. Use a slotted spoon or strainer to transfer cranberries to a wire rack, or onto parchment paper. Separate cranberries from each other so that they don't dry in clumps. Allow cranberries to dry for half an hour or more. Roll cranberries in sugar until completely coated. Store in a airtight container in the fridge. In a small bowl, mix together melted butter, icing sugar, and vanilla. Add in 2 tablespoons of milk and mix until combined. If mixture is too thick to pour, and more milk. How thick or thin you want it is up to you - I like it just thin enough to pour and settle nicely, but thick enough that it doesn't just run off the cake. Top with sugared cranberries if desired. *The glaze will firm up and become more solid quite quickly as the melted butter cools - you can always glaze cakes and quickly pop them in the fridge to help the glaze set firmly.